replaces contaminated soil that was under the street. We’re almost done on East Marine View Drive! All lanes should be open the week before Christmas at the latest. Final checks of restored connections to temporarily relocated utilities are under way. Then we’ll add the top layer of pavement, traffic signals and other finishing touches. The paving layer and markings may be temporary, due to cool weather. If needed, we’ll return in the spring to install permanent paving and markings. By late January 2019 we’ll start cleanup work at Wiggums Hollow Park, closing part of it. We expect that project to wrap up late this spring. We’ll begin the cleanup – and temporary closure – of Viola Oursler Overlook as soon as March 2019. We appreciate everyone’s patience with these projects! We’re about to tie up a major intersection in Everett. We hope you’ll use the posted detours while we dig out contaminated soil that’s under East Marine View Drive at the intersection with Riverside Road – and part of the interchange with SR529/North Broadway. We're working where part of the Everett Smelter once stood. It’s a spot where part of a smelter that produced lead and arsenic once stood. 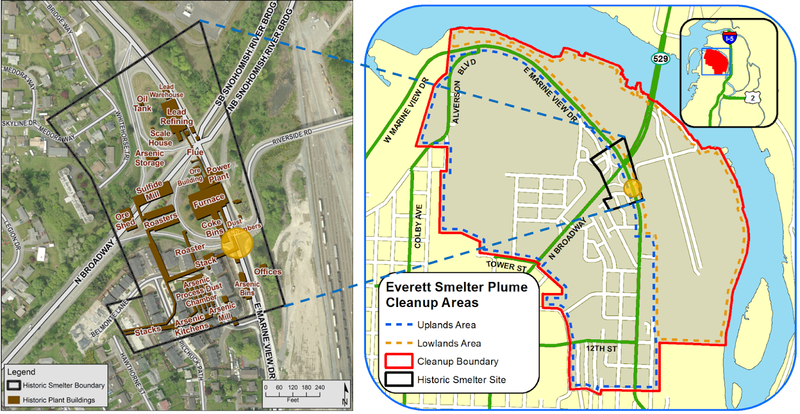 Removing soil and rubble from demolished buildings – to a depth of about 18 feet – will clean out sources of lead and arsenic contamination in groundwater that flows to the Snohomish River. The Everett Smelter operated from 1894-1912, but the contamination wasn't discovered until 1990. Smelter operations left high levels of arsenic and lead on the former smelter property. Contaminated particles from the smokestacks settled over a 1.1 square mile area. Cleanup of other parts of the smelter property took place in 2005-2007, but the part under the street has been left in place. Until now, that is. Later this month our contractors will start about three to four months of work. They’ll dig out an expected 4,300 cubic yards of soil and rubble, haul it to a licensed disposal site, and replace it with clean soil. Dust control is a high priority on this project, and crews will use water sprays during the excavation. Before you go: An alternate route may be your best bet. Arrows show where traffic can go in each work phase. 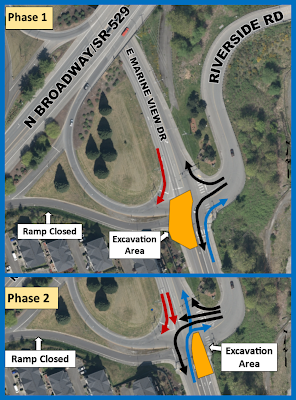 To do all this we’ll need to close off parts of East Marine View Drive, one side at a time. It will take six to eight weeks for each of the project’s two phases. We’ve tried to allow as much traffic flow as possible, but we’ll have to block some lanes and turn directions. We’re maintaining access to and from Riverside Road throughout the project. The pictures to the right paint the thousand words it might take to explain it all. See the latest details in an update to information we mailed in June to addresses within a mile of the project. Posted detour routes may add a few blocks to your travels, but let you avoid our temporary bottleneck. Our contractor will have flaggers to direct traffic past the work area. As with any other road construction project, please slow down as you approach and pass through the site. Meanwhile, we’re still cleaning residential yards contaminated by smelter operations. We completed 11 yard cleanups over the winter – bringing the total to 395 – and are preparing to start working with 20 more this summer. shaped into place, prior to re-landscaping. 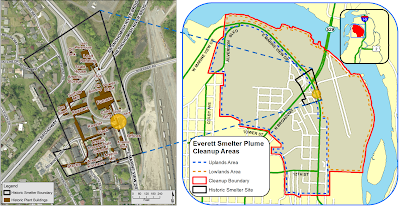 We’re offering soil sampling at any yard we haven’t previously sampled in the 170-acre Everett Smelter plume cleanup site in northeastern Everett. We work with property owners in this area on a voluntary basis. We start with soil testing and when needed, we offer to remove contaminated dirt and bring in clean soil to restore the yard. If you live within the cleanup site and your yard has not had its cleanup, please continue to follow healthy actions that include washing hands with soap, leaving shoes at the door, regular floor and carpet cleaning, and frequent washing of children’s toys and pacifiers. Like yards, parks in the cleanup area can need cleanup, too. 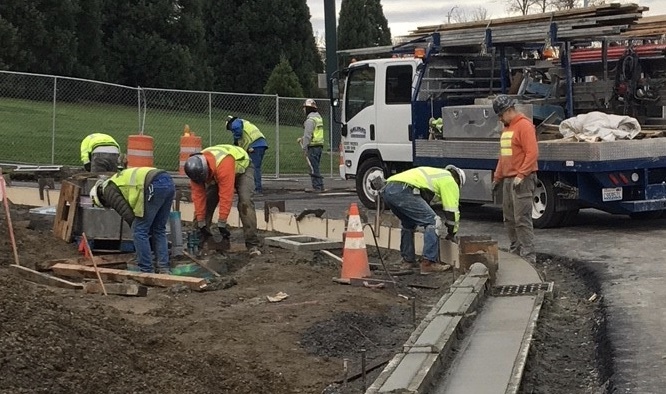 In 2016, we completed the cleanup of American Legion Memorial Park, the first of three parks where we're replacing soil in the cleanup area. We’re planning such work after Labor Day at Wiggums Hollow Park and Viola Oursler Overlook. Both parks will close during these cleanups. We should be done, including establishing new lawns, in early 2019.